In 2010, VELCO realized that its flat roofs and flat campus would accommodate a solar array that could help to offset the energy it takes to manage Vermont’s power grid and thereby save Vermont ratepayers some money. The company contracted to install six solar arrays—two on the roof and two pole-mounted— with a total capacity of 50 kW. In five full years of operation, the panels have produced nearly 388 MWh of power—enough to power 280,000 homes and offset more than 50 tons of coal. The array has saved VELCO $60K in electricity costs. The installation does not show up on the map of Vermont solar resources because it directly offsets VELCO usage and is not interconnected with the grid. In 2016, VELCO instituted two employee benefits to encourage adoption of electric vehicles. Five plug-in charging stations were installed and are available for employee and visitor use at the front, side and back parking lots, including charging of the electric vehicle that has been added to the VELCO fleet. In addition, employees can now take advantage of a $1500 rebate for the purchase or lease of a new electric, hybrid, or hybrid-electric vehicle. 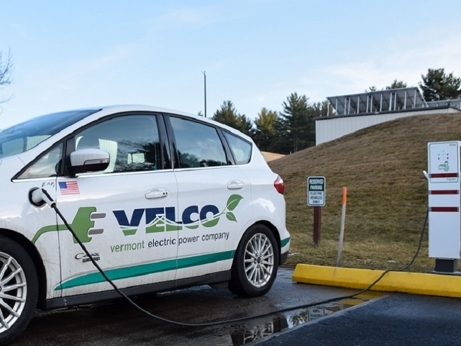 By July 2017, seven employees had taken advantage of these benefits, and visitors to the campus are delighted to find they can charge their vehicles while doing business at VELCO.